As part of Golden Agri-Resources’ (GAR) commitment towards transparency and open and inclusive dialogue with stakeholders, the company has established a Grievance Procedure which can be found on its Sustainability Dashboard. This is to ensure that, as a company, GAR is responsive to grievances from external parties. This includes any individuals, government organisations, NGOs or media outlets with concerns related to the implementation of GAR’s sustainability policies. GAR values the input of stakeholders in helping to achieve the aims of the policies and in enhancing transparency throughout its supply chain. 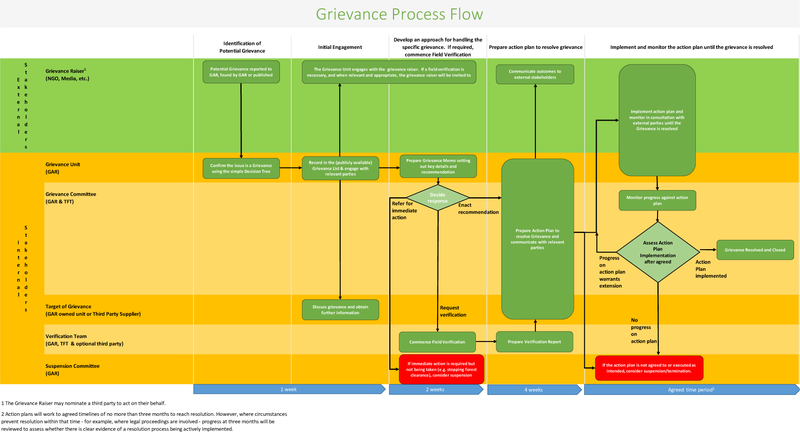 Underpinning this procedure is the desire to respond quickly to any grievance raised and engage in dialogue with stakeholders, as set out in the Grievance Process Diagram below. GAR will be providing regular progress updates via the Grievance List which is also published on the Sustainability Dashboard.